PRINTAPROMO has compiled the detailed information provided on this website from internal and external sources to the best of its knowledge and belief, using professional diligence. We endeavor to expand and update this range of information on an ongoing basis. The information on this website is purely for the purpose of presenting PRINTAPROMO and its products and services. However, no representation is made or warranty given, either expressly or tacitly, for the completeness or correctness of the information on this website. Please be aware that this information although accurate on the day it was published may no longer be up to date. We therefore recommend that you check any information you obtain from this website prior to using it in whatever form. Advice given on this website does not exempt you from conducting your own checks on our latest advice - particularly our safety datasheets and technical specifications - and on our products, with a view to their suitability for the intended processes and purposes. Should you require any advice or instructions concerning our products or services, please contact us directly. Users of this website declare that they agree to access the website and its content at their own risk. Neither PRINTAPROMO nor third parties involved in the writing, production or transmission of this website can be held liable for damage or injury resulting from access or the impossibility of access or from the use or impossibility of use of this website or from the fact that you have relied on information given on this website. The user of this website is fully responsible for the content and correctness of details he or she sends to PRINTAPROMO as well as for the non-violation of any third-party rights that may be involved in such details. The user gives his or her consent for PRINTAPROMO to store such details and to use the same for the purpose of statistical analysis or for any other specified business purpose, unless the information involves personal details, going beyond master data or usage data. 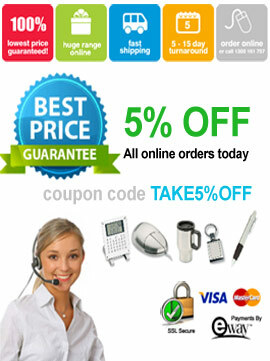 In particular, PRINTAPROMO is entitled to use the contents of such messages, including ideas, inventions, blueprints, techniques and expertise contained therein, for any purpose, such as the development, production and/or marketing of products or services and to reproduce such information and make it available to third parties without any limitations. All trademarks on this website are the property of the PRINTAPROMO or suppliers, unless otherwise noted or in any other way perceivable as third party rights. Any unauthorized use of these trademarks or other materials is expressly prohibited and constitutes a violation of copyright, trademark law or other industrial property rights. If you choose to use our referral service to tell a friend about our site, we will ask you for your friend's name and email address. We will automatically send your friend a one-time email inviting him or her to visit the site. “Printapromo.com.au” does not store this information and uses it for the sole purpose of sending this one-time email. All “Printapromo.com.au” employees take your personal information very seriously. All employees must learn and obey our security policies. Access to member personal information is limited to key management personnel and our member services department. The information is ID and password protected and our Web security is reviewed on a monthly basis. We have also installed and implied our site with a 128 bit encryption SSL. After becoming an “Printapromo.com.au” subscriber you may correct/update your personal information by clicking on the 'My Account' link at the top of any page, entering your ID, password and birth date when prompted and clicking the Edit Information button. The changes you make will be reflected in our databases instantly. If you wish to deactivate your account, you may contact our member services group through the 'My Account' section, or the 'Contact Us' section. From time to time we may send out email messages alerting you that products are available, to remind you about providing feedback or for promotional offers. In addition, you will receive communication from us 1) if you contact us for a particular reason, 2) to receive your orders, or 3) we need to contact you for administrative purposes such as winning a contest. Administrative e-mails will not contain promotional materials. If you choose to receive our News Letters, they will contain promotional materials from “Printapromo.com.au”. You agree that all artwork/s that are uploaded to our site are free from copyright restrictions and that you own the exclusive rights to such photos. Logos or messages displayed in this website appear only for the purpose of demonstrating the processes available for advertising and branding. They do not suggest the products with those logos or messages are available for sale, nor are they intended to suggest any real or implied endorsement of PrintaPromo Online Printing itself or of those products by the company whose message or logo is shown. All online pricing is to be used as a guide only and can be changed, modified or withheld at our discretion. All pricing is subject to change daily.